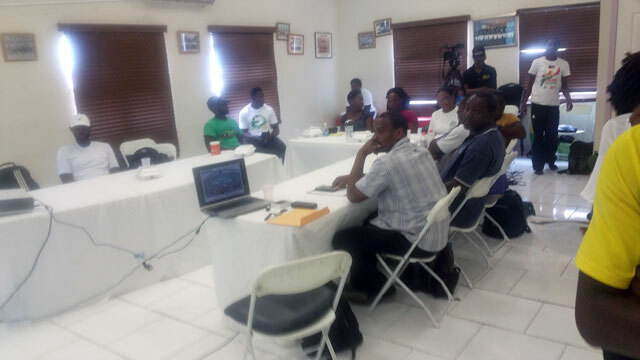 Basseterre, St. Kitts-Officers of the department of sports and school teachers from St. Kitts and Nevis are currently undergoing training in Handball put on by the St. Kitts Hand Ball Association with view of an inaugural championship starting later this month. The workshop is being lectured by International Handball Professor Dr Frantisek Tavosky from the Czech Republic. During the opening ceremony for the workshop was held on Tuesday (Apr. 18) and President of the Handball Association Leroy Greene spoke of the significance of the event. “In a sense we are creating history today because you coaches are only the second set of people from St. Kitts and Nevis who have had formal Handball training. We had training last year but that was just beach handball but now we are doing three different types of training within a nine day period,” he said. Mr. Greene indicated that the he sees handball as an alternative sports for females in the Federation. “Women in St. Kitts and Nevis and very limited opportunities to do sport they basically only play netball and some in track and field,” he said. He added that a number of partners were key in making the workshop possible including the National Olympic Committee and the Ministry of Sport. Speaking at the ceremony Permanent Secretary in the Ministry of Sports Stanley Knight stated that the development of a new sport compliment the ministries efforts of establishing a framework where they are hoping to build a national sports policy. “This national sports policy has three very simple pillars sports for all, sports for development and excellence in sports,” he said. He then congratulated the participants and declared the workshops open. Jenifer Nero a representative for the St. Kitts and Nevis Olympic Committee for his efforts following more than a year of planning. “I want to congratulate the president because he has been pushing this issue of starting the handball for over a year. I’m very heartened to see all of you hear and as a member of the women’s commission I’m happy to see gender equity in terms of handball,” she said. He also congratulated the president for being able to put on such a course. The workshop will run from April 18-27 and the inaugural championships will commence take place on April 22nd at the Pam Tyson Netball facility at Warner Park.